Recent trends in databases, such as multi-tenancy and cloud databases, can contribute to increases in delays and variation for transaction response times. For geo-replicated databases, this issue can be even worse, since the network delays between data centers can be very unpredictable. Developers have two options when transactions are delayed unpredictably: they may choose to wait indefinitely for the transaction to complete, or they may timeout early and be uncertain of the transaction outcome. Neither outcome is desirable, so we propose a new transaction programming model to help with this situation. We propose PLANET (Predictive Latency-Aware NEtworked Transactions), which is a new transaction programming model that helps developers write flexible transactions. By using PLANET, developers can write transactions to better deal with the variation in latencies possible in modern database environments. 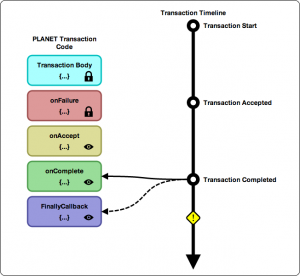 PLANET provides the developer with more information of the progress and stages of the transaction, so the developer can define how the transaction should behave in different situations. By exposing more details, PLANET enables developers to express user-defined commits for their transactions. PLANET also exposes a commit likelihood calculation for transactions, which can be utilized for user-defined commits as well as admission control. By using the features of PLANET, systems can provide responsive transactions, as well as better system utilization for cloud databases. More information about PLANET can be found at our PLANET website. There, we have a simple interactive visualization to demonstrate how some of the features of PLANET work. We also have examples of several use cases of the transaction programming model.